This article is about Meta Knight's appearance in Super Smash Bros. Brawl. For the character in other contexts, see Meta Knight. Unveiled at E3 2006, Meta Knight (メタナイト, Meta Knight), commonly abbreviated as MK, is a character in Super Smash Bros. Brawl. Originally from the Kirby universe, Meta Knight joins the brawl as a starter newcomer who wields a sword, Galaxia, as his primary weapon. Meta Knight is voiced by Eric Newsome in the English version and by Atsushi Kisaichi in the Japanese version. Meta Knight is notable for being at the top of the Brawl tier list due to numerous advantages. His attacks generally have extremely high speed in terms of both startup and ending lag, and nearly all of his standard attacks have transcendent priority. He is in almost no trouble offstage due to a large amount of recovery options that grant him a long, relatively safe and unpredictable recovery, along with extremely effective edgeguarding options including moves that can wall of pain, two semi-spikes, and easy stage spikes against certain characters. Meta Knight's edgeguarding capability is unarguably the best in the game, as is his ability to gimp opponents. He also has many great combo setups, with a very strong combo game due to easily being able to string many of his attacks together, as well as some of his moves being able to break opponent combos. His KO moves are quick, powerful, and reliable. Meta Knight can easily play very aggressively due to the speed and power of his attacks, but he can also play defensively without much trouble, with his aerials being able to space well and his great ability to air camp, along with his very fast roll and air dodge (though his spot dodge is only average). The former also gives him access to a huge glide toss that is fast and covers a very long distance. Meta Knight has incredible matchups; he has no overall disadvantageous matchups along with three other characters from the Smash Bros. series (Pikachu in Smash 64 and Fox and Falco in Melee), and currently only Pikachu is considered to have an even matchup against him, but even this is heavily disputable with mixed to negative reactions among the competitive community and many believed the matchup to be in Meta Knight's favor. This does not mean he has absolutely no disadvantages, however. Meta Knight is a lightweight character, meaning he is knocked out fairly easily, especially against characters with many high-power attacks such as Snake. He also has a small shield which makes him somewhat vulnerable to shield stabbing from certain characters. His poor air speed and slow grab release animation also make him susceptible to grab release combos from many characters, most notably Marth, who can combo Meta Knight into a variety of moves, including forward aerial, dash attack, Dancing Blade, short hop Dolphin Slash, buffered down aerial, buffered up aerial, or buffered neutral aerial from his air release. Meta Knight additionally may have trouble KOing against good DI and/or momentum cancelling, particularly if his best finishers are getting stale. He also has many multi-hit moves that are easily SDIable, limiting his ability to rack up damage easily, along with his moves generally dealing average damage. 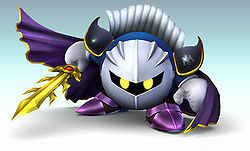 Due to his incredible fighting prowess, general unpopularity in the Super Smash Bros. community (he was and is considered "broken" among many), negligible weaknesses and over-centralization of the metagame, Meta Knight was banned for a time between the period of January 9th, 2012 and April 16, 2012 from the Unity Ruleset, which was being pushed as the only valid ruleset. This makes Meta Knight and Bayonetta the only characters in the Super Smash Bros. series who have been banned from a standardized tournament ruleset, although Bayonetta's ban was far less prominent. Even prior to his banning, he has been placed in his own tier, SS, at the very top of the tier list. Since the Unity Ruleset committee has been disbanded, it is once again up to each tournament's organizer whether Meta Knight should be banned or not. Meta Knight, as seen in the first trailer for Super Smash Bros. Brawl at E3 2006. Meta Knight is a small character, roughly the same size and shape as Kirby, and with the same weight as Pikachu. He also boasts the sixth fastest dash speed, a fast walking speed, and average falling speed, though his air speed is very low, tied for the third worst. Meta Knight's greatest asset is his remarkable frame data. Almost all of his moves have little startup and endlag. The best example is in his up aerial, which can be performed three times within a short-hop, with its duration being at a total of 13 frames. The reach of his attacks, though average overall, is disproportionate to his small hurtbox. His disjointed range and incredible attack speed make his moves exceedingly difficult to punish, and all of his moves have transcendent priority, except for Mach Tornado, Drill Rush, dash attack, and glide attack. The aforementioned traits give him a powerful neutral game and approach, even though he lacks a projectile. He can easily pressure with his aerials and tilts, and his neutral special, Mach Tornado, covers a long horizontal distance and offers great protection, making it a potent approach option that is difficult to counter. Though his air speed is poor, he is gifted with five midair jumps and the ability to glide twice, allowing him to weave in and out of danger. While Meta Knight's moves deal fairly low damage, their speed and low power allow them to easily chain into one another, giving him a nearly unrivaled combo game. Again, this is demonstrated by his up aerial. Combined with his jumps, his up aerial combos into itself for as much as 30%, thanks to its speed and low knockback, and it can lead into other moves as well, such as Mach Tornado and Shuttle Loop. His KO power is also formidable, especially for a lightweight. Though his forward smash has high startup, it is his strongest finisher. Shuttle Loop has high knockback, quick start-up, and is difficult to punish, as he can glide away to safety. Down smash is quick, hits on both sides, and has high power, making it his most reliable grounded KO move. His glide attack is fast, and can KO early near the upper blast line, though it is rather telegraphed. Contributing to Meta Knight's strong KO power is his offstage game. Aside from up aerial, all of his aerials are viable finishers offstage. Neutral aerial has relatively high knockback, his forward and back aerials can be used to perform a pseudo-wall of pain, and his down aerial is a deadly semi-spike. Aerial Shuttle Loop is a semi-spike, and can be used to stage-spike recovering opponents and unwise edgeguarders. His stellar recovery compliments his superb air game. He has five midair jumps and the ability to glide. Mach Tornado offers great horizontal distance, decent height, and protection. Drill Rush is horizontal and can be angled. Dimensional Cape allows him to vanish and move in any direction before reappearing. Finally, Shuttle Loop grants high vertical distance, and transitions into a glide for excellent horizontal recovery. Despite lacking a meteor smash, his recovery and dominating air game make him a terror to face offstage, as he is capable of gimping and edge-guarding almost any foe. However, Meta Knight has notable weaknesses. Being a lightweight, he has very poor endurance, though his quick momentum cancel in his up aerial aids him slightly. He has a slow grab-release animation, which leaves him vulnerable to grab-release combos, notably against Marth, who can combo him into a variety of moves, including a down aerial meteor smash. His poor air speed, while easily worked around, can give him a hard time avoiding moves like Pikachu's Thunder. Meta Knight has many multi-hit moves that can be SDI'ed out of, such as Mach Tornado, limiting his ability to rack up damage, and this compounds his damage output, which is average at best. Though his neutral and approach games are strong, he has trouble fighting against competent campers, such as Snake and Falco. Meta Knight has a rather long 32-frame delay before he can meteor cancel. Combined with his light weight, this gives him trouble against characters with useful meteor smashes, particularly Falco. However, his recovery distance negates much of this issue. Overall, Meta Knight has overwhelming combat prowess, and his weaknesses are hard to exploit and can be worked around. His mobility, attack speed, range, priority, and recovery allow him to play both aggressively and defensively, give him a low-learning curve, and grant him plenty of room for error. 1-2% (loop) When held, Meta Knight yells and executes a lightning-fast series of slashes that can also hit enemies behind him. Can set up a down smash if buffered correctly. 4% Slashes twice in front of him (inward then outward), then once upwards. Last hit deals vertical knockback. Only pressing the attack button once will cause Meta Knight to perform only the first hit; press it twice more to slash the second and third times. At higher percentages, it's difficult (if not impossible) to connect all three hits since the first hit has enough knockback scaling to prevent the other hits from connecting. 6-8% Stabs upward in a turn. Meta Knight's famous upward stab during his boss battles. Decent vertical knockback, and in some cases at higher percentages, makes up for his up smash's weak vertical knockback, although it must sweetspotted to KO under 150%. Sweetspot is at the tip of the sword (similar to Marth's tipper sweetspots). 4-7% Thrusts his sword across the ground at a low profile. Good for tripping (which sets up a grab or other follow-up), deceptive range (has more range then Marth's down tilt, though only by a few pixels), very fast and it can be used to pseudo-crawl. Deals more damage if the opponent is closer to Meta Knight's body. 6-8% Does a forward thrust kick into a braking stop with vertical knockback. His only attack (other than all of his throws, excluding the back throw) that does not use his sword. Lacks transcendent priority due to this move involving his foot. Deals more damage if the opponent is closer to Meta Knight's body, similar to his down tilt. 14% Pulls his sword back for a second, then slashes in front of him outward. His strongest move in terms of knockback. It is the only normal attack he has with particularly high startup, but it has a very fast charge release and very little ending lag. When fully charged, it can KO at 87%. 3% (hit 1), 2% (hit 2), 4% (hit 3) Slashes above him three times. Like Link's up smash, but much faster and with less range, damage, and knockback, though it can KO at very high percentages. 11% (front), 13% (back) Slashes in front of him, then behind. Arguably his best KO move due to its extremely fast speed. One of the fastest down smashes in the game, tied with Wolf's and behind R.O.B. 's and Zelda's. 12% (hit 1), 5-7% (hit 2) Slashes while spinning in a circle, similar to Sword Kirby's Sword Spin and his Knight Spin in his home series. Surprisingly powerful, decent KO option. Good OoS option because of its speed and power. 3% (hits 1-2), 4% (hit 3) Slashes in front of him three times. Can perform a wall of pain variation, though Meta Knight's poor air speed makes it not as effective as Jigglypuff's wall of pain. 3% (hits 1-2), 4% (hit 3) Like his forward aerial, but behind him and more slowly. To compensate for the slower slashes, this move has slightly more knockback. However, it still has almost no startup lag and the first two hits while landing sets up a down smash on many characters, along with wall of pain potential like his forward aerial. 6% Slashes above him very quickly, has decent knockback. One of the fastest moves in the game, and the aerial with the least ending lag. Great for juggling opponents into the upper blast line. If tap jump is set to "on", Meta Knight will rise up with each slash. The distance varies depending on how many of Meta Knight's jumps remain. It can chain into itself at low percentages. It can be performed three times in one short hop. 7 (center), 9% (sides) Slashes below him very quickly. Sends the opponent on a semi-spike trajectory and is quite deadly offstage, especially against opponents with poor horizontal recovery. 12% Slashes in front of himself. A fairly powerful move with great vertical knockback. One of the two sword-based moves of his to lack transcendent priority. 3% Jabs opponents with his wings' claws. A slow pummel. 6% (hit), 3% (throw) Boots the opponent away and upward with a back-somersaulting kick. A very fast throw. 7% (hit), 3% (throw) Warps behind the opponent and slashes at them with an outward strike. Good knockback. Good for putting opponents off-stage. Can KO at very high percentages, and much earlier on the ledge. 12% Like Kirby's up throw: jumps into the air holding his foe, and then crashes down, albeit without an explosion and less powerful. Can still KO at very high percentages. 1% (hits 1-10), 1% (throw) Like Kirby's down throw: stomps on opponent with his toes multiple times, then ends by stomping down on them with his foot's underside. Compared to Kirby's d-throw, it's slower and produces horizontal knockback. Depending on the opponent's DI, it can be followed by other attacks, and even another grab at low percentages on fastfallers. 6% Slashes on either side of himself. 5% Slashes on either side of himself. One of the two sword-based moves of his to lack transcendent priority. 8% Quickly slashes with his blade. 10% Gets up slowly, then slashes with his blade. Mach Tornado 1% (multiple hits), 3% (last hit) Spins at a very high speed, attacking in a tornado. He slashes them multiple times and traps them. This makes escape via directional influence difficult. When the Tornado is finished, the last hit dealt causes slightly more than moderate knockback, but can be very dangerous if used near the top of the screen as Meta Knight could suicide himself if he cannot touch stage edges in his helpless state when off stage or with the addition of being put helpless, can be punished. Mach Tornado can be controlled by pressing left or right to move in that direction, and going upwards is done by pressing the special move button rapidly, which also extends the amount of time Meta Knight spins. It is also a great recovery move, it gains great horizontal distance on top of some vertical distance, especially if Meta Knight jumps before using the move. It also has near instantaneous start-up, and with multiple large hitboxes that can clash with ground and aerial hitboxes, it provides great protection to Meta Knight. However, something to note is that Meta Knight will bounce off of edges rather than grabbing them if he hits them while he is in the tornado. He also cannot grab edges during the first few frames of his helpless animation out of the tornado. Lacks transcendent priority, unlike most of his attacks (though this actually makes it more difficult to interrupt). Drill Rush 1% (hits 1-9), 2-3% (hit 10) Leaps sideways with his blade outstretched. If he hits an enemy, he performs a combination lasting up to a good 2 seconds, knocking Meta Knight's opponent upward. Also, when finished, he pulls back a bit. Meta Knight can also change the course of the attack, as he is shown using the same attack upward, allowing it to be used as a recovery. After using the attack, Meta Knight becomes helpless. It is possible to cancel the ending lag of the attack by making the end hit the edge, allowing it to be virtually lag free, and allowing it to be used to rush opponents in such stages as Battlefield; this is known as Drill Rush Canceling. Of all of Meta Knight's recovery moves, this move gives the most vertical distance. Shuttle Loop 9% (clean), 5% (late) Jumps into the air with his sword pointed upwards, goes into a loop and glides forward with his blade extended. The Shuttle Loop itself has good knockback, making it one of Meta Knight's most powerful KO moves. The ground Shuttle Loop has vertical knockback and invincibility frames at the beginning of the move and the air version has strong horizontal knockback, being a solid edge-guarding move due its high base knockback. The initial upswing of the Shuttle Loop is mostly used at the end of Meta Knight's combos. It should also be noted that the end of the Shuttle Loop attack automatically initiates a glide, which can be used in addition to the vertical recovery to add good horizontal recovery. In addition, because Meta Knight can do a quick attack to conclude a glide, the Shuttle Loop can be timed to do two consecutive attacks — the initial upswing, and the quick swing from the glide. The glide from this attack is slower than his regular glide, and allows better control. However, the move makes him helpless if the glide ends/is canceled, or if he does the glide attack. Dimensional Cape 14% Teleports in a direction, controllable with the Control Stick. If the attack button is pressed or the special button is held, he will perform a slash. It can be used to disappear from projectiles, and even attacks. Many players disregard the cape, but it is very useful for surprising opponents, making recovery less predictable and for edgeguarding. This is an extremely "flashy" move, and is often used for showing off. Meta Knight can use this as a recovery move, but afterwards, he will become helpless, even if the attack connects. The attack KOs at 163% from the ground. Galaxia Darkness 40% to trapped opponents, 18% for others Swings his cape out directly in front of him while shouting "Know my power!" or "Behold...". If he misses with his cape, Meta Knight pauses for a brief time, and the Final Smash fails. When it connects (the trapping hitbox is a bit longer than the edge of the cape), characters nearby become trapped, the screen then darkens to black, and after a few seconds, a large, single slash appears near Meta Knight, as he then slices the trapped opponents with one, powerful strike. Characters who are trapped by Meta Knight's cape always receive high, upwards knockback that can KO above 50%, with super armor ignored. Any opponents who are not trapped are also attacked, but instead take about half damage and weak, upwards knockback. These slashes can also damage and even KO allies, without regarding Friendly Fire being disabled or not. The weaker slash part of Galaxia Darkness can be avoided by dodging with correct timing. Warps in with his cape. Up taunt: Wraps himself in his cape, as if teleporting, while scoffing. Side taunt: Says "Fight me!" (勝負だ!, Let's battle! ), while examining his sword, slashing twice, and finally pointing his sword in front of him. Quickly and subtly swings Galaxia. Puts his cape around him and back. His cheer is the same between both versions. Meta Knight says "Fight me!" in a slightly different tone than his side taunt. A metal remix of the Kirby victory theme, which originated from Kirby's Dream Land. Up: Flings out his cape and says "You have much yet to learn". Left: Disappears while saying, "Come back when you can put up a fight!" Meta Knight has by far the most favourable matchup spread in Brawl, with a weighted total of 252 (more than twice the amount of Ice Climbers, the character with the second highest weighted total) on the current SmashBoards matchup chart. He has one even matchup, soft counters nine characters, counters thirteen, hard counters eleven, and has two close to unloseable matchups. Against other top and high-tiered characters, he has one even matchup, soft counters seven matchups, and counters one matchup. Even his one even matchup (against Pikachu) is highly disputed and even proven to be wrong, and many players, even Pikachu professional ESAM, believe it to be in Meta Knight's favour. The other closest to even matchups against Meta Knight include Falco and Ice Climbers, the former due to his ability to projectile camp against Meta Knight, and the latter of course due to their 0-death chaingrabs, but even then, they're heavily stage dependent, only coming close on neutral stages. Meta Knight is considered the hardest matchup for many characters, with certain characters, such as R.O.B. and Luigi, having their positions on the tier list significantly dropping in large part due to their poor matchups against Meta Knight. Meta Knight can easily beat every character in the game and is the toughest matchup for almost every other character. Aki - A top Japanese Meta Knight player, placing 2nd at Sumabato X Final. Ally - Although best known for his Snake, Ally picked up Meta Knight as a secondary/co-main and achieved nationally dominant results with both characters. ANTi - Known as one of the best Meta Knights in the United States and the world, with multiple top finishes at events such as Pound V and Apex 2013. Noted for his vast array of matchup experience and knowledge. Atomsk - Although more famous for his King Dedede, Atomsk played Meta Knight as one of his mains as well, and used him to to achieve several top 8 finishes at nationals. Cody - One of the few still-active Brawl players. Consistently ranked first on Anther's Ladder, and took a set off Nairo at Super Smash Con 2017. DieSuperFly - One of the most dominant players during Brawl's early lifetime. Dojo - A nationally dominant Meta Knight player from 2009 to 2011, famous as the first player to defeat Mew2King in Meta Knight dittos, at WHOBO 1, where he placed 2nd. Edge - Widely considered the best player in Japan along with 9B, placing 1st at Sumabato X Final and multiple other Japanese tournaments. Havok - Known as a top Meta Knight from the West Coast and one of the best in the United States during his prime in the MLG era. Kakera - One of the best players in Japan, placed 5th in singles and 1st in doubles with Otori at Apex 2012. Ksizzle - A nationally dominant Meta Knight player from 2009 to 2010, famed for being one of Ally's most difficult opponents in tournament. Lee Martin - A nationally dominant Meta Knight player in his prime during the MLG era. Maguro - A top Brawl player in Japan, known for placing 1st in doubles with Kakera at Sun Rise Tournament. Mew2King - The most dominant and arguably most famous player in Brawl's competitive history; considered the undisputed best in Brawl's early lifetime, and still remained a strong national threat in the post-MLG era. Nairo - Widely considered to be the best Meta Knight player in the world. Holds several tournament victories including SKTAR, Apex 2014, CEO Dreamland, and Super Smash Con 2017. Famous for his aggressive style of play, often using offstage Shuttle Loops and other risky edgeguard maneuvers to prevent opponents from returning to the stage. Ranked 1st on the 2016-2017 SSBBRank. Otori - One of the strongest players in Japan and the world during his prime, won 1st in singles and doubles with Kakera at Apex 2012. RAIN - Known for his extreme dominance in the Japanese scene, achieved 1st place at Sun Rise Tournament. Seibrik - The best Meta Knight main from Florida, had a notable performance at Pound V finishing 3rd, beating ADHD and UltimateRazer among others. Shadow - A major innovator of MK's metagame in Brawl's early stages; most famed for the "Shadow Loop," using Meta Knight's Shuttle Loop near the air as a powerful edgeguarding technique. Tearbear - A West Coast powerhouse in 2010-2011, with top 8 placings at MLG Columbus 2010 and GENESIS 2. Tyrant - Arguably the best player on the West Coast, remaining a national threat from 2009 to Smash 4's release. ZeRo - Often considered the best player in the world during his period of dominance in early 2014. Meta Knight has been ranked 1st on the tier list since a few months after the game's release, although some players believed Snake was the best character. However, as Brawl's metagame evolved, his advantages in combat became more prominent, and Meta Knight mains such as Mew2King began dominating tournaments; as a result, Meta Knight was (and still is by the overwhelming majority) considered the undisputed best character, and has consistently held the top spot, commonly in his own tier above the rest of the cast. Due to his strengths as a fighter, more competitive Brawl players use Meta Knight over any other character. This reflects in his tournament results, where it is not rare to see almost half of any given top eight in Meta Knight legal tournaments using Meta Knight, and Meta Knight has won almost three times the amount of money in tournaments than the second-most successful character, Snake. These factors have cemented Meta Knight's placement at the top of the tier list for the entirety of the Brawl metagame up until the present day. However, with recent innovations in the Ice Climbers' metagame, especially their chain grab setups capable of annihilating any player given a single opportunity, Meta Knight is finally being challenged by some professional smashers as not being the undisputed best character in practice. Despite this, Meta Knight still remains first place, with the Ice Climbers currently being a spot below him. Talks about banning Meta Knight later surged again, owing to Meta Knight's rapidly increasing dominance and Meta Knight players primarily being those who won tournaments and/or took up the top results. Such an example was KTAR 6, where five of the top eight placers used Meta Knight. In addition, data compiled by John Numbers showed that Meta Knight had won over 50% of total tournament earnings in tournaments that had more than thirty entrants Meta Knight in total won $42,394.32 in 2011 U.S. tournaments when money is split in character usage (and $59,490.07 when not split), while the next most successful character, Snake, had only won $12,125.33 when split (and $20,860.29 with no split). The overall increasing centralization of Meta Knight was also said to have caused Brawl's metagame to shift too radically; some characters, as mentioned above, significantly dropped down the tier list in large part due to poor matchups against Meta Knight. The decision to ban Meta Knight, however, immediately proved controversial. Although a large number of smashers had voted for his banning, a number of top professionals who mained Meta Knight later stated they would not attend tournaments where Meta Knight was banned, and a number of tournament organizers stated that they would ignore the Meta Knight ban, as to keep tournaments profitable by allowing top professionals to enter. Regional differences also began to play a role in how Meta Knight was banned; while a number of powerful regions, such as the Tristate Area, featured numerous top players that used Meta Knight, some smaller regions featured fewer top players who used Meta Knight and they subsequently adopted the ban. As a result, while Meta Knight was banned in some areas, he was not in others, leading to the subsequent fractures in the Brawl competitive scene; with the differing legality of Meta Knight, different regions had different banned stages, as some stages gave too strong a benefit to Meta Knight while not extremely buffing other characters. Furthermore, some top professionals refused to travel to other regions in response to the ban on Meta Knight or lack thereof. The controversy surrounding Meta Knight and his ban was derided by the Melee community; following his ban, in a newer ruleset update, the Melee Back Room sarcastically added that Meta Knight was banned from all Melee tournaments. The Unity Ruleset Committee later disbanded on April 16, 2012, with Marc stating that "it is up to individual TOs to decide what is best for their events." As a result, Meta Knight's ban is not considered universal, and tournament organizers may choose whether or not to ban the character. Since then, a majority of Brawl tournaments have allowed Meta Knight. Although no longer officially banned in singles, in doubles, teams consisting of two Meta Knights are universally banned, as this combination is considered far too powerful in doubles. It is revealed that before the events of the Subspace Emissary, Meta Knight was attacked by the Subspace Army, who had the intent of taking the Halberd. He was able to hold them off until King Dedede attacked him, causing him to lose his ship. When Meta Knight is first featured in the Subspace Emissary, he attacks a lone Marth outside of a large castle. He quickly learns that Marth is not his enemy when they are both surrounded by Primids. After a successful battle, both warriors chase the Ancient Minister, who is carrying a Subspace bomb. Both are unsuccessful in their attempts in destroying the bomb (Meta Knight's left wing was shot by the Ancient Minister's laser, forcing him to land and change to his cape to extinguish the flame); luckily, Ike appears and uses his Aether to catch the Minister off guard and destroy the bomb. With the bomb destroyed, all three head back to the castle to clear out any remaining Primids. Later, they are all seen traveling the wastelands together and battling Galleom. Meta Knight then saves Lucas and an unconscious Pokémon Trainer from a giant free-fall after they defeat the same boss. Meta Knight then begins to ascend a large cliff face, followed by the Ice Climbers (who see his ascent as a racing challenge), in order to reach the Battleship Halberd. At the summit, Lucario challenges Meta Knight to a sparring duel. To the relief of the Ice Climbers, the winner revives the loser, having no hostile feelings. The Halberd then crashes into the side of the mountain in an attempt to destroy the defeated Great Fox, which is being held by the arm of the Combo Cannon. Meta Knight and Lucario quickly board the Halberd, while the Ice Climbers fall off the summit, into the canyon. The pair run into Snake while on board and join forces with him to take back the Halberd. After rescuing Peach and Zelda, the trio continues on to the control deck. There they discover that the ship is being piloted by a gang of Shadow Bug Mr. Game & Watches. Snake runs towards them and throws them all out of the window and onto the bridge, who fuse together to form a gigantic metallic monster called Duon. Once Duon is defeated, Mr. Game & Watch joins the group, along with Peach, Zelda, Fox, and Falco. Meta Knight remains in the Halberd's control center and does not take part in the battle. Meta Knight takes back control of the Halberd and reunites with the members from other groups. The aircraft of the other heroes is placed inside the Halberd, which heads towards the Subspace Gunship with all of the Super Smash Bros. heroes on board (except for Sonic, Ness, King Dedede and Luigi). After using the Subspace Battleship's main cannon to create another Subspace portal, Ganondorf spots the Halberd on the horizon and orders the battleship to open fire. The Halberd is struck down, but the heroes are able to escape on board Samus's Gunship, Captain Falcon's Falcon Flyer, Olimar's Hocotate ship, and Fox's Arwing. Kirby destroys the Subspace Battleship by slicing through it with the Dragoon air ride machine and the heroes enter Subspace to pursue Ganondorf and Bowser. Meta Knight is turned into a trophy by Tabuu along with the rest of the Super Smash Bros. heroes upon their entrance into Subspace. He is later revived by Kirby. He rejoins the others in the fight against Tabuu. Event 2: Landmaster Ignition: As Fox with a Smash Ball, the player must survive against Meta Knight and Sheik. Fox must rely on his Landmaster as his opponents take less knockback from his regular attacks. Event 3: Pink Ball Repulsion: The player controls Meta Knight and must defeat Kirby before the platform reaches the Halberd portion of the stage. Event 20: All-Star Battle x1: Meta Knight is one of the eight opponents fought in this event along with Wario, Pit, Zero Suit Samus, Olimar, Lucas, Diddy Kong, and the Pokémon Trainer. Co-Op Event 5: The Yoshi Team of 50: As Meta Knight and Pit, both players must KO all 50 Yoshis on Rainbow Cruise before completing one lap of the stage. Co-Op Event 13: Blades of the Quick and Mighty: Marth and Ike must defeat Link, Meta Knight, and Ganondorf on Temple. Meta Knight's main and Final Smash trophies can be obtained by clearing Classic Mode and All-Star mode respectively with Meta Knight. The head of the Meta-Knights, and something of a rival to Kirby. He's quite an accomplished swordsman. Following his code of knightly ethics, he once delivered a sword to Kirby and demanded single combat. His giant cape transforms into wings, giving him the power of flight. He's shown his face briefly before, but his relationship to Kirby is still a mystery. Meta Knight's Final Smash. He flips his cape, and the darkness within envelops his foes and plunges the world into shadow. He then unleashes a series of sword strikes that do terrible damage and launch his foes. In the darkness, Meta Knight can also reach and attack distant enemies. One can imagine Meta Knight zipping back and forth at high speed to accomplish this. Meta Knight is one of the five playable characters in Brawl to lack a meteor smash. Meta Knight is one of only three characters in Brawl able to perform three aerials in one short hop, the others being Lucario and Luigi. Meta Knight's eyes are never closed; this is also the case for his SSB4 incarnation. Bowser, Meta Knight, and Marth can all perform the Floor glitch. Meta Knight is the first character in the series to be banned from tournament play, albeit temporarily, and also holds the longest ban for any Smash character. Meta Knight is also the first character to have a different victory fanfare from the other characters of his universe, and is the only one in Brawl who has this. Meta Knight's page at Smash Bros Dojo!! Moveset information at Smash Bros. Dojo!! This page was last edited on April 10, 2019, at 10:47.